While maintaining the rest of your house, you may overlook the attic. It’s understandable - you hardly ever use it, and the rest of the house is so clearly visible to you at all times. However, neglecting your attic can lead to serious issues. The better maintained your attic is, and the sooner you spot any potential problems, the easier and faster it’ll be to get it back in shape. Rodents and mold are the most common culprits when it comes to pests in the attic. There are signs that may point you towards identifying a problem, and they are worth looking out for. If you don’t regularly use the space, it’s a good idea to have a look every now and then to check for signs of pests. You can do this while you’re cleaning the rest of the house, for example, as it’s a natural extension of that task. If you do suspect that you have pests in the attic, it’s time to have it professionally cleaned. When you go to check for signs of rodents and mold, you’ll also notice how dirty and dusty the attic has become. It’s normal to have a bit of dust up there, but if it gets out of hand, it’ll need to be cleaned professionally. 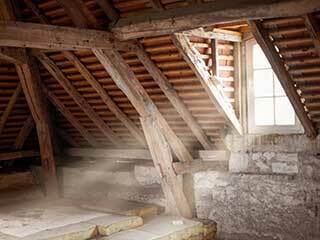 Dust and dirt make it uncomfortable to go into the attic, and make it harder to keep an eye out for other problems. We can make sure both your attic and any crawlspaces are clean. All parts of your home should be regularly maintained in order to function properly. That includes your attic. Keep it in mind when doing your regular home maintenance - that way you’ll naturally have your attic cleaned at suitable intervals. This way of keeping your attic clean means that potential problems are professionally identified and fixed early on. We are experts at everything related to attic cleaning. Regardless of whether you simply need maintenance cleaning, or there’s a problem with the attic that needs to be solved, we’re here to help.